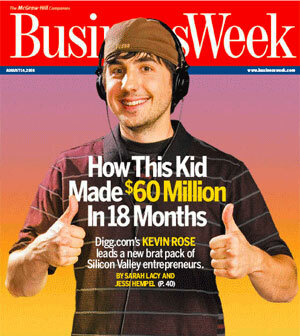 Kevin Rose is an American Internet Entrepreneur, known for his several Internet start-ups. He is the co-founder of Revision3, Pownce, WeFollow and Diggnation. His masterpiece however is the social-bookmarking website Digg. Robert Kevin Rose was born on February 21, 1977, in Redding, California. Most of his childhood was spent in Las Vegas, where at eight he began his first experience with computers, when his father purchased a Gateway 80386 SX16. Rose soon got in to the world of BBS in the late 1980s. Eventually he was running a two-node Wildcat! BBS (and PCBoard) with a CD-ROM full of shareware for people to access. In 1992 Rose transferred to Vo-Tech High School in Las Vegas, to study computers and animation. Upon graduation from high school, he attended the University of Nevada Las Vegas, majoring in computer science, but dropped out in 1998 to pursue the 1990s tech boom. After dropping out, he worked for the Department of Energy, at the Nevada Test Site, as a technology advisor. He later worked for several dot-com startups through the American technology and venture capital company CMGI. In October 2004, Kevin decided to invest $6000 (which was supposed to be for a deposit on a house for him and his girlfriend) into a site, called Digg, together with his friends Owen Byrne, Ron Gorodetzky and Jay Adelson. Digg was designed as a social news website, made for people to discover and share content from anywhere on the Internet, by submitting links and stories, and voting and commenting on submitted links and stories. Voting stories up and down is the site's cornerstone function, respectively called digging and burying. Many stories get submitted every day, but only the most Digg stories appear on the front page. The site digg.com was launched to the world on December 5, 2004. A Rose's friend, proposed to call the site Diggnation, but Rose wanted a simpler name. He wanted the name Dig, because users are able to dig stories, out of those submitted, up to the front page, but as the domain name dig.com had been already registered, the site was called Digg.com. The original design of Digg was free of advertisements, but as site became more popular, Google AdSense was added to the website. In 2005, the site was updated to "Version 2.0", which featured a friends list, the ability to "digg" a story, without being redirected to a "success" page, and a new interface. In June 26, 2006, the Version 3 of Digg was released with specific categories for Technology, Science, World & Business, Videos, Entertainment and Gaming as well as a View All section where all categories are merged. In August 27, 2007, Digg altered its main interface, mostly in the profile area. In April, 2007, Digg opened their API (Application Programing Interface) to the public, thus allowing software developers to write tools and applications based on queries of Digg's public data, dating back to 2004. The domain digg.com attracted at least 236 million visitors annually by 2008.